Turkish cuisine can't be discussed without paying special attention to the Turkish breakfast. It is a truly unique start to the day, with a line-up of tastes all it's own. Most Turkish folks begin their mornings just like the rest of the world. They wake up, get ready for their day, send their kids off to school and of course, have their first meal. However, the similarity stops here. 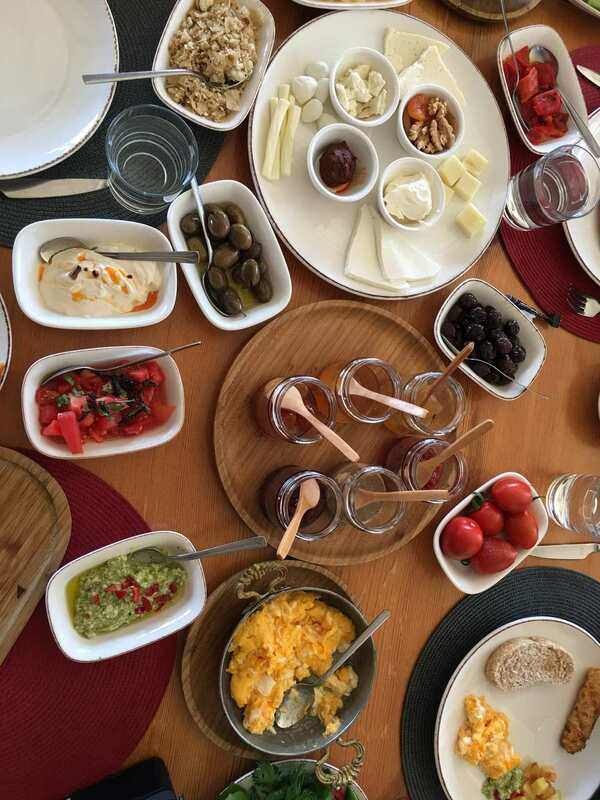 Breakfast in Turkey is not just a necessity; it's a traditional family gathering, a sit-down affair with a line-up of tastes all its own that you start looking forward to the night before. Each morning the tea is lovingly brewed, and the table is set with small plates and flatware designed especially for eating breakfast foods in bite-size portions. Foods are arranged elegantly no matter how modest the table. A classic Turkish breakfast, better known as 'kahvaltı' (kah-VAHL'-tuh) consists of fresh cheeses like feta and kashkaval, black and green olives, fresh-baked white bread, fruit preserves, honey, sweet butter and plenty of brewed black tea served in Turkish tea glasses. If you have guests, more elaborate selections are offered such as hard-boiled eggs, a single egg "sunny-side up" cooked and served in a tiny copper skillet called a "sahan" (SAH'-han), as well as omelets, chunks of sesame-based "halvah", cut and peeled tomatoes, cucumber, sweet peppers and variations of homemade phyllo dough and cheese pastry called "börek" (bor-ECK'). Another great breakfast classic with eggs is called "menemen." Menemen is a juicy, spicy version of scrambled eggs with onions, red and green peppers, and tomatoes. In place of bacon or breakfast sausage, slices of "sucuk" (soo-JOOK'), a spicy type of salami, and "pastırma" (pas-tur-MAH'), a type of cured beef covered with a thick layer of spices are served together with eggs and are the main ingredient in omelets. Soup is also a common staple for breakfast in many homes, especially during the winter months. To newcomers, a Turkish breakfast can seem bland and unsatisfying when compared with the heavy, sugary breakfasts served in Europe and North America. But with time, one's body gets used to this healthy, light fare in the morning, and then there's no turning back. You will find yourself searching the markets for the best quality olives and cheeses, seeking out the freshest tomatoes and becoming an expert at blending teas to make that perfect aromatic brew each morning. And to this day, rose petal jam still gives me great joy at breakfast time! It is as aesthetically pleasing as it is pleasing to the taste with a beautiful, blush pink color, and ever-so-delicate rose aroma and flavor. If you have time in the morning, a leisurely breakfast on a sunny porch served with lots of brewed black tea, and the daily newspaper is a must. But many people on the run take advantage of the many bakeries that open early selling fresh bread, and many varieties of soft rolls with fillings like cheese, black olive paste, mashed potato and chocolate. Don't pass up the "simit" (sim-EET'), a sesame-covered bread ring sold in bakeries and more infamously by street sellers everywhere. There's nothing like a simit with melted cheese inside to start the day.